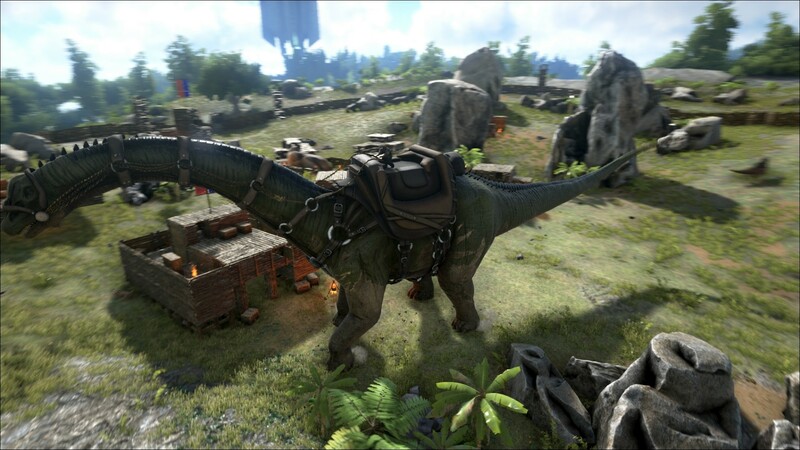 With ARK on the Nintendo Switch, you can literally open the door, get on the floor, and walk the dinosaur. ARK: Survival Evolved, a game about living, hunting, and surviving amongst dinosaurs in a wild open world, is coming to the Nintendo Switch. ARK is already a huge hit on Steam, Xbox One, and PlayStation 4, so the arrival of a Nintendo Switch edition isn't a big surprise. It's still kind of cool, though. ARK for Switch is receiving both a physical and digital release, and we should see it by Fall. A press release distributed earlier today by Epic Games confirms the Switch adaptation of ARK "includes the complete contents and features of the original game; from the massive and mysterious ARK island, to the more than 100 prehistoric- and fantasy-inspired creatures such as the T-Rex, Giganotosaurus, Rock Drake and Reaper." It's like a grittier, more realistic take on The Flintstones. Oh wait, that already exists. It's no secret by now that many big triple-A games require a bit of downscaling to run well on the Switch, especially in handheld mode. Some, like DOOM for the Switch, turn out quite well. A lack of care, however, nets you a horrid piece of work like WWE 2K18 for the Switch. Dark Souls for the Switch is looking quite good; let's hope ARK follows down the same sunny path. ARK: Survival Evolved already has a mobile adaptation, and an adorable Minecraft-inspired spin-off game is getting a Switch release, too. Regardless of how you like your dinosaur sci-fi prepared and served, Epic is willing to accommodate you. Tagged with Epic Games,	News,	Nintendo Switch. Ark: Survival Evolved on Switch: Is it Really a Disaster? What happens when you port a rough game to a portable platform.